And have abundant life now! In the Garden of Eden there stood two trees, both very pleasing to sight. Beauty beyond our imagination filled the Garden. Freedom of choice was given, but true and complete freedom could only come through one Tree, the Tree of Life. The other tree was a counterfeit and had the glamor of deceit; it had death behind its appearance of beauty. The Tree of Life held true glory, leaves for the health of nations. 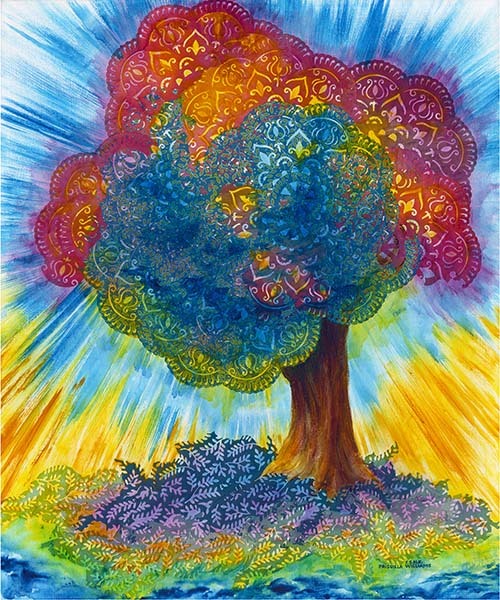 Here in this image we might find that the Tree of Life in our broken world offers its colorful healing leaves for the nations, laying them down at its roots for our access. The River of Life flows in celebration with the Tree of Life. We are invited to eat from this Tree, EAT THEREOF. Through Christ we can have abundant Life now and into eternity.